If we had to make a quick choice between evolution and creationism, we would choose creationism. There are only a few questions about evolution that matter. We have answered them. The other one million questions are just for fun and can be ignored. You don’t need our massive scientific knowledge to put evolution in its place. Evolution Nexus is located at https://evolutionnexus.com with a mirror (duplicate website) at https://eon.lfnexus.com. Also, https://evolution.lfnexus.com will take you to https://evolutionnexus.com. If they existed, extreme man-apes would simply have been man-apes that could be mistaken for human beings. There is disagreement in the evolutionary scientific community as to the validity of methods used to analyze and evaluate fossils. However, let us assume, for the moment, that the methods are valid. What would this mean? What it would mean is that there were extinct “man-apes.” What would these man-apes have been. There are two views – evolutionary and data. The evolutionary view is that the man-apes were transitional forms; that is, life-forms between more ancient apes and man. The man-apes would have been ancient apes with higher intelligence and more human-looking appearance than modern apes. The evolutionary view is based on a mixture of data and fantasy. The fantasy is that the man-apes gave birth to human beings. However, no birth fossils (fossils of mothers giving birth to babies) have ever been found. The data view is always correct because it simply reports the facts. If fossil analysis/evaluation methodologies are valid, there were ancient apes with higher intelligence and more human-looking appearance than modern apes. There are no birth fossils to prove that they gave birth to human beings. It is common knowledge that some life-forms are extinct (no longer exist); for example, the dinosaurs. The so-called transitional forms leading up to human beings, if we accept the scientific methodology as reliable, would have simply been more anthropomorphic (more human-looking) apes now extinct and nothing more. Also, any so-called, human-like abilities would be accounted for by more advanced intelligence than modern apes. 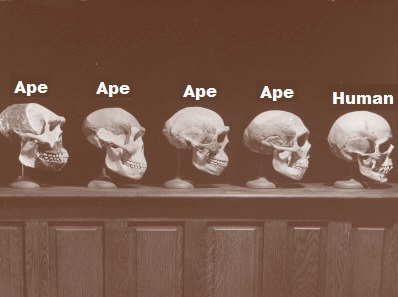 They would have simply been smarter, more human-looking APES from which man did NOT descend (did NOT evolve). Why Did God Make Some Animals Superficially Resemble Human Beings? If evolution were true, there would have to be MSSF (mixed species society fossils). That is, fossils of prehumans and humans together. These would have to exist since the humans would have to have been cared for and raised by the prehumans. But, none have ever been found. We have proven that similarity is not proof of evolution (see Evolution’s Great Fallacy). So, what do we have below? 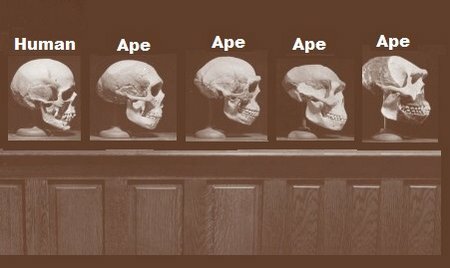 Evolutionists would say, “See how the skull evolved over time.” But what we really have is nothing more than a set of skulls of different apes and of a human being lined up by similarity. To make our point clearer, here are the same skulls lined up by age. In other words because two animals resemble each other one must give birth to the other . Well, let’s see. A zebra resembles a horse. That must mean zebras give birth to horses or horses give birth to zebras. An alligator is similar to a crocodile; therefore, one of them must give birth to the other. And then there’s the turtles and tortoises and the frogs and toads and the dolphins and porpoises and the donkeys and mules. We could go on. Similarity does not prove parentage. See our discussion elsewhere on the subject of the difference between science and truth. Might not be 24-hour days. The days of Genesis are 24-hour days. Science does not disprove the Bible. Science does disprove the Koran. Science does disprove every other so-called holy book on the planet. Well, first, of course, evolution is not fact. But, if it were, so what? The Bible teaches, like evolution (and before Darwin), that the human body is made up of the same elements and compounds found in the soil. It also teaches that the human body was formed before the human soul. Therefore, if evolution were true, the human body would have evolved and, then, God would have given the evolved body a soul. Since this is all true, why do we fight evolution? We fight evolution because its supporters teach that it is a fact or that it is more than a hypothesis. Evolutionists are evil because they apply evolution to a realm that evolution has nothing to do with – the spirtual realm. Evolution has to do with plants and animals. It has nothing to do with God and angels. Evolution has to do with protoplasm, nuclei, and mitochondria. It has nothing to do with spirt, mind, and soul. Evolution has to do with adaptation and natural selection. It has nothing to do with salvation and divine election. So, evolutionists, stick to what you know – plants and animals – and keep your mouths shut about what you don’t know – the deep things of life: God and human immortality. The Seven Keys have been updated. Evolutionary science promotes the mythical ideas of evolution, adaptation, and natural selection, among others. BOSS (Biological Origins Science) teaches the truth that, instead, there is the evolution construct, adaptation construct, and natural selection construct, which are mental constructs imposed on the biological world and not actual, physical entities. The proof that evolution, adaptation, and natural selection are imaginary entities is the fact that evolutionary science has never identified physicochemical agents or processes that define these entities. Nevertheless, the corresponding mental constructs, properly termed the “evolution construct,” “adaptation construct,” and “natural selection construct,” are useful in organizing biological history. Except for the people-from-apes thing, evolutionary science is correct (we didn’t say “true”) and contradicts nothing in the Bible. It is unfortunate that many have alienated so many others from the riches of knowledge found in evolutionary science. Now, because of the entrenched stigma (discredit) associated with the term “evolutionary science,” we have coined the term “biological origins science” or “BOSS” for short. Remember, there is one difference between BOSS and evolutionary science, you are not a product of evolution . In physics, objects “experience” force. For example, a paper clip “experiences” the force (pull) of a magnet and the oceans “experience” the gravitational pull of the sun. These forces manifest themselves in changes in physical objects. They exist in the physical world. In evolutionary theory, all of the so-called forces have no existence in the physical world. There are no evolutionary entities that act on physical objects. Evolution, natural selection, and adaptation, which are the so-called forces of evolution, do not pull on paper clips or pull on the oceans. They don’t exist. What are they then? They are extrapolations (imaginations logically but not experimentally associated with reality). Thus, the whole system of evolutionary thinking rests on pure imagination . Trying to change the definition of evolution to hide the fact that they include human beings. Over a century and a half of grief and societal disruption to pay for.